The next evolution of the Marvel Cinematic Universe brings a founding member of The Avengers to the big screen for the first time with Marvel Studios. Armed with the astonishing ability to shrink in scale but increase in strength, master thief Scott Lang must embrace his inner-hero and help his mentor, Dr. Hank Pym, protect the secret behind his spectacular Ant-Man suit from a new generation of towering threats. Against seemingly insurmountable obstacles, Pym and Lang must plan and pull off a heist that will save the world. A particular friend told me that the trailer had revealed the whole storyline of the film, and that it is how it is, so there was no real need to watch the film. Well, I won’t say he’s completely wrong, but there were still quite a few pleasant surprises which made the film a should-watch. So Scott Lang (Paul Rudd) plays the reluctant superhero who was lead to stealing a suit with unknown value and powers. That’s of course where all the fun comes in, learning of the capability of the ants and how to control them, learning how to shrink and jump through a key hole, using the interesting shrinking and enlarging weapons from Dr. Hank Pym (which manage to succeed in creating some hilarious comic relief during the climactic action scenes. The great thing about the Ant-Man film is that it’s part of the Marvel Cinematic Universe. Not only will you see the Ant-Man battling one of the Avengers (Guess who wins? ), you will get to see the S.H.I.E.L.D.S agent (cough Carter) and another 2 avengers in the post credit scenes! Ant-Man’s crush with the Avengers and his surprising first fight with Falcon (Anthony Mackie) was something that made Scott Lang real and charming. For me, it is Scott Lang’s friend, Luis (Michael Peña) who stole the show. Some will call him the film’s life force, simply because he is one of the rare few character who is un-Marvel-ly. I love his narrating scenes (director Peyton Reed calls them “tip montages”) where he rambles off to explain how he got certain information. The scene goes on to montages and snippets showing how the message was being passed, with all the messengers speaking through Luis’ mouth. I was a little disappointed with the motives of the villain Darren Cross (Corey Stoll) though. While Corey Stoll was a great actor expressing the grudges of an abandoned apprentice, his master plan seems so… comic-style, or should I say PG-rated and minor? While Hope (Evangeline Lilly) hasn’t got the charms of Black Widow, I was impressed with how they put her in as an ambitious lady who wish to be involved and help her dad. And yes, she got a nice punch. But aside from that, Hope is a stiff character who doesn’t seem to fit. The interaction between Hope and Scott was forced and chemistry is almost non-existent that it made certain scenes redundant. Despite so, any fan of the Marvel Universe should catch the film and PLEASE, stay through till the end. There’s one mid-credit and one post-credit scene where you will get to meet my favourite Captain! In one scene, Luis (Michael Pena) hums “It’s a Small World,” which is a reference to the fact that the film is about a hero the size of an ant, and also a nod to Marvel’s parent company Disney from whom the tune originated. Pena had been reading his 7-year-old son Roman Marvel comics, so when Pena landed the role, his son told him, “Don’t mess this up.” He felt the pressure not only to be funny in the movie, but to do his son proud. Also, the actual character is based on Pena’s friend Pablo. Ant-Man’s helmet is influenced by the helmets of Iron Man and the Autobot Transformer Bumblebee. While Edgar Wright was working on the film, he requested that Marvel would refrain from using Ant-Man or Wasp until he had finished the movie, which is why they were absent from The Avengers (2012). This was originally supposed to be the the first chapter of Phase Three in the Marvel Cinematic Universe. Now Captain America: Civil War (2016) will open Phase Three and this has moved to the end of Phase Two. Hope Van Dyne (Evangeline Lilly) doesn’t actually exist in the comics. Hope Pym, on the other hand, does. In an alternate future, where she’s still the daughter of Hank and Janet, but has a twin brother, Henry Pym Jr. and becomes a super villain known as the Red Queen. In the comics, Hank Pym created Ultron. Scott’s daughter, Cassie (Abby Ryder Fortson), is a child here, but in the comics, teenage Cassandra starts stealing Pym particles and eventually develops the same shrinking and growing powers her superhero dad has. As the superhero Stature, she joins a group called the Young Avengers. This will be the first time John Slattery has portrayed Howard Stark since Iron Man 2 (2010). In the interim, Dominic Cooper plays a younger version of Howard Stark in Captain America: The First Avenger (2011) and Agent Carter (2015). He last played the role in Iron Man 2 (2010) and can be seen when Tony is watching the home videos of his father. In the very last scene of the movie, Luis recounts to Scott that Sam Wilson is looking for him. During one inquiry, Falcon asks about a “guy who gets small” and is told, “We got guys who jump. We got guys who swing. We got guys who climb up walls.” This is a reference to Spider-Man (Tom Holland). Joseph Gordon-Levitt was considered for the role of Scott Lang / Ant-Man. 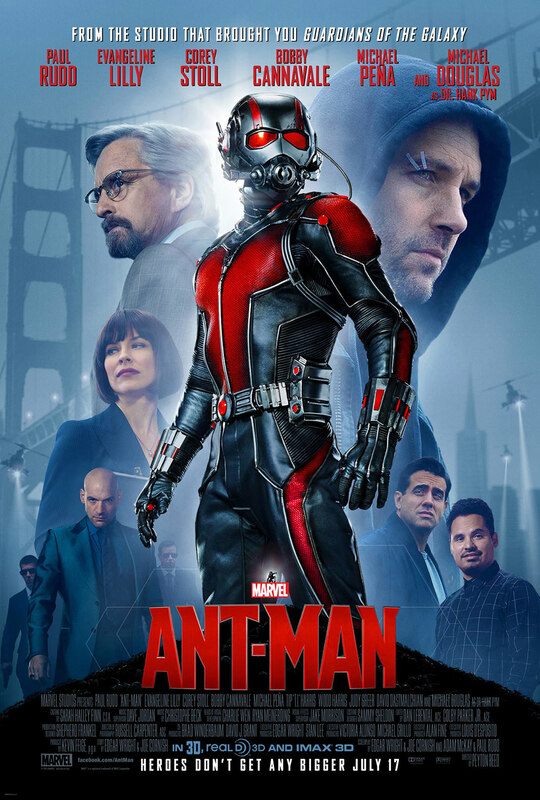 Check out Ant-Man (2015) Official Website and Facebook Page! Ant-Man (2015) is out in cinemas on 16 July 2015. I love this movie. Its entertaining with a good storyline and humors. Ooh, i can’t wait to watch this! I refused to read after the part you put up the spoiler alert(thankyou!) … so bookmarked and will come back soon! I have seen this movie and for me, it’s just like any ordinary Marvel movies. Kids were more overwhelmed with it. I have yet to watch this film. Seems a good Marvel film. Reading your post it looks a brilliant movie and my son will definitely be going to watch it. I have yet to watch Ant Man. You made me more interested in watching the movie with the added info and trivia about the characters and the movie. I’ve seen the movie online, and it is a COOL movie. Great editing, etc…simple but very funny. More fun watching it compared with the AVENGERS. I was asking the kids if they wanna catch this over the weekend – but since they don’t know ant man, they actually said no! Hmm – will try again this weekend. Watched Antman last Saturday. It was fun. Never know it is a Marvel movie until I bought the tickets. I want to watch Ant-Man. Been meaning to but I hope to find time to be able to do this. I like the Marvel movies so I will definitely watch this. I have never heard of Ant-Man before so it’s good to read a bit of a background here before I’d be able to see it. I have heard so much about this movie. I would love to see this film and I hope to catch it this week. i just watched it today. was a huge disappointment imo. i expected alot more from marvel films. guess i’ll stick to the avengers from now on. I tried to find in my free movie site but the thing was it’s not clear. Love to watch from Marvel characters. Hoping that Ant-Man can do better than any heroes around. It’s surprising to see you rate a movie 4/5 because it would usually just be 3.5. I’ve never been interested with this movie as I do also find the title funny. But your review made me want to see it; I’m curious to check what earned your rating. The biggest shame is that Ant-Man is going to be a hard sale to conventional audiences. Yes, people find the trailer funny and they love Marvel films, but when the title is Ant-Man it sounds ludicrous, and not in a positive sense. Please ignore that initial impression you may have and give it a chance; you’ll be happily surprised.